Is Israel helping forge the sabre of its own demise? Cranes discharge containers from a cargo ship at Nantong Port. China has forked out billions of dollars to upgrade two Israeli port facilities as part of its maritime “silk road” infrastructure project. In doing so, Beijing has also secured a quarter-century lease. The security ramifications for Israel and its closest ally, the United States, are particularly important. This is especially the case for a nation such as Israel. The Israelis rely on the three key ports at Haifa, Ashdod and Eilat for almost all imports and exports. Haifa is home to Israel’s nuclear submarine force—one of Israel’s primary second-strike capabilities in the event of nuclear war. The entrance to the port’s military facilities will now be monitored by China. China’s efforts to establish the multitrillion-dollar trade route has drawn global suspicion. Chinese President Xi Jinping has called for a “military-civilian integration” policy. This includes “all fields of national economic development and defense building.” As China acquires ports, the security ramifications cannot be ignored. The contracts were won by China after Israeli authorities decided to privatize aspects of the commercial ports. 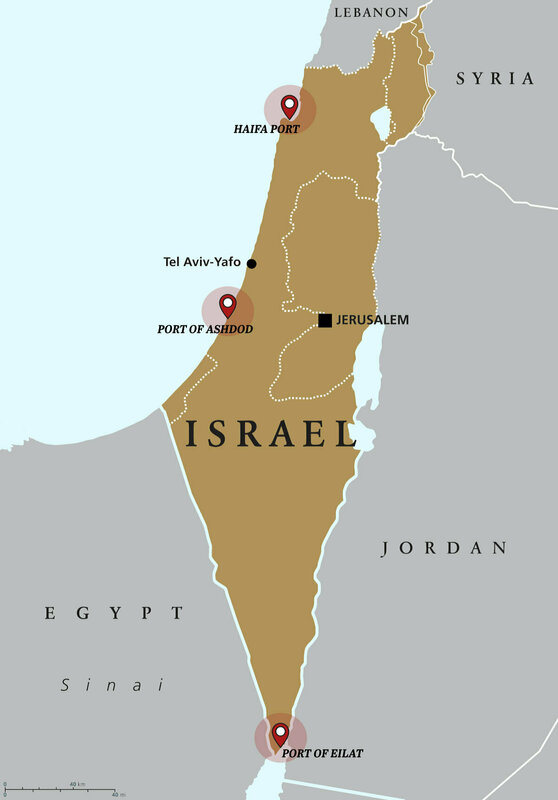 By allowing private port facilities to operate, the Israeli authorities are hoping to break up the monopoly of the two state-owned ports. This would make the industry more competitive and drive down prices. But there is a far more dangerous price that must now be paid. Take Haifa, for example. The Shanghai International Port Group (sipg) won the development contract. Signed on May 28, 2015, the contract grants Beijing control of the port for 25 years. It is set to be inaugurated in 2021. To the south is Ashdod. Here at Israel’s busiest port, a subsidiary of China Harbour Engineering Co. Ltd. won the mid-2014 contract. They will build an $876 million port. The United States-Israel alliance may also pay a price. Espionage isn’t just a threat to Israel; American vessels frequent these ports too. American forces will no longer feel secure using Haifa as an extended base of operations. America’s 6th Fleet, while based out of Naples, docks at Israeli ports. Its security is jeopardized by Chinese companies running the ports. American policymakers will be upset that Israel was so quick to put the U.S. in such a compromised position. But neither Israel nor America truly realize what is taking place before their eyes. It is about much more than espionage. China’s takeover of port facilities is a means to an end—an astounding, prophetic, world-shaking end! While the Mediterranean currently lacks the flashpoints of the South China Sea, it is by no means less important. China and Europe are connected via this seaway. The Mediterranean is the farthest reach of China’s maritime silk road. And as many are starting to see, this silk road will bring both economic and military power to China and Europe! The Bible backs this up. In fact, God issues a startling warning to America and Israel about the two powers currently linked by these ports. The book of Isaiah reveals a soon-coming relationship between Europe and China. It is a “mart of nations.” The new silk road is helping to connect these powers economically. Isaiah 23:1-2 reveal the biblical identities of the major nations involved: German-led Europe (Tyre), Japan (Tarshish) and China (Chittim). This prophecy discusses a European-Asian relationship, bound by trade and commerce. The greatest shock is that these powers will besiege nations like America and Israel. China is reaching out through the maritime silk road. Already we see its consequences. Economically it bypasses America. Even militarily the U.S. is affected. From the Mediterranean to the Strait of Malacca, there are few places U.S. naval vessels can avoid the gaze of “commercial” Chinese port authorities. If Israel understood Bible prophecy, it would be far less comfortable with joining China’s “string of pearls.” But God’s prophecies are repeatedly ignored by world leaders. Instead we see China investing in tunnel operations at Mt. Carmel, the light rail in Tel Aviv, and purchasing the Tnuva dairy farm. Israel doesn’t realize it, but it is aiding and abetting the rise of an economic power that will turn on it! China and Europe are positioning themselves to undermine America, Britain and Israel. The foundations of the mart of nations are being laid. God makes it plain in Isaiah 23. The mention of the sea (verses 2, 4, 11), oceans (“great waters,” verse 3), ships (verses 1 and 14), and seaborne merchant traffic (verse 8) indicates this is a trade alliance. Verse 3 calls it a “mart of nations.” Mart means emporium, trade or merchandise. Verse 13 mentions Italy (Chaldea) depicted in association with Germany, whose biblical identity is Assyria, or Asshur. If you want to know more about the coming economic siege and the scriptures concerning it, read “Trade Wars Have Begun.” God gives us ample warning. And He also gives us plenty of good news that is to come from the fulfillment of these prophecies. At that time, the string of pearls will be broken. The Messiah will have new roads built that all nations will use. And these will lead to Jerusalem, the city of peace. From there, nations will be taught the right way to economic prosperity and how to live abundant, radiant, peaceful lives.